Enjoy a fresh take on Catering. 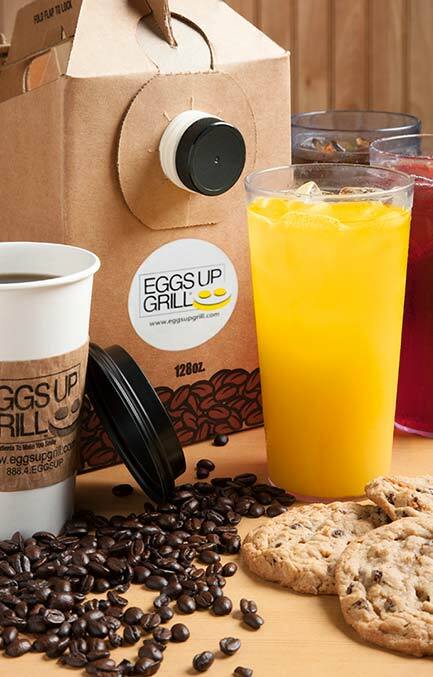 Scrambled eggs, choice of meat, signature home fries, grits and warm buttermilk biscuits. Serves per person. 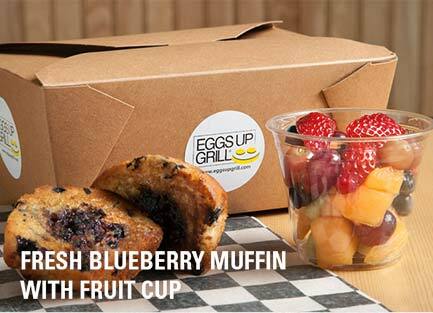 Two scrambled eggs with a golden-grilled blueberry muffin and fresh fruit. Serves per person. Savory Breakfast Sausage tucked into a warm buttermilk biscuit. Serves 8-10. 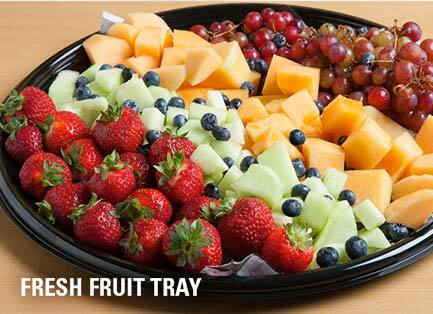 A refreshing assortment of fresh-cut melons, grapes and berries. Serves 8-10. Fresh-cut melons, grapes and berries. Individual serving. 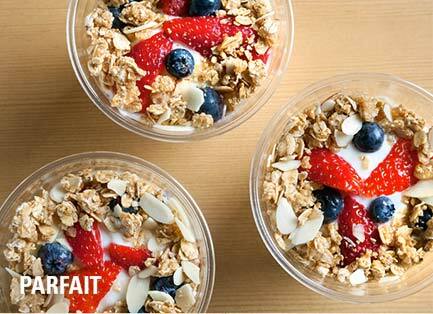 Creamy vanilla yogurt, crunchy granola and fresh berries. Individual serving. All platters include chips. Serves 8-10. Our freshly prepared chicken salad with lettuce, wrapped in a flour tortilla. 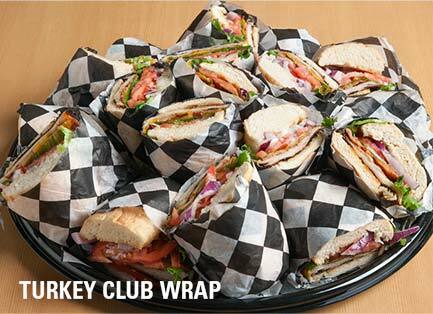 Crispy bacon, thinly sliced turkey breast, ham, fresh lettuce, tomato, cheddar cheese and mayonnaise. Thinly sliced turkey breast, crispy bacon, lettuce, tomato and mayonnaise. A Simple Classic. Crispy bacon, lettuce, tomato and mayonnaise. Thinly sliced turkey breast, crispy bacon, Swiss cheese, lettuce, tomato, avocado and mayonnaise on Tuscan bread. 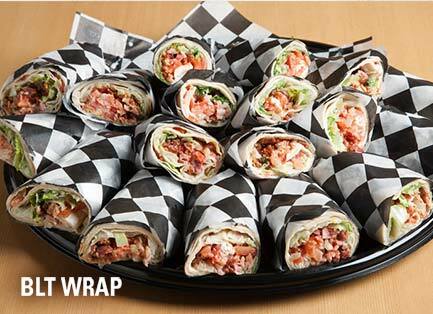 A combination of Turkey Bacon Avocado BLT, Club Wrap, Chicken Salad Wrap and BLT Wrap. 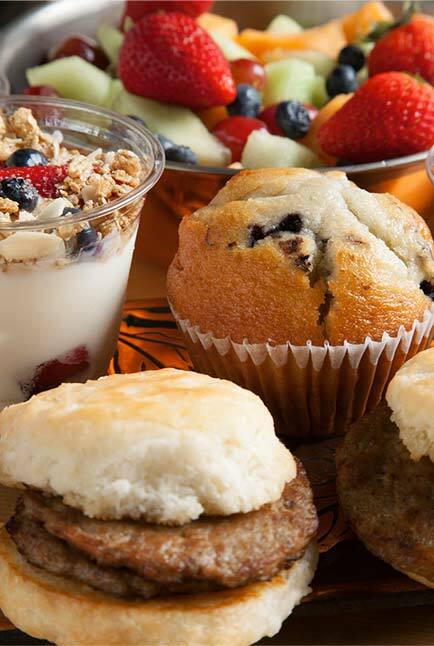 Blueberry muffin with a cup of fresh-cut melons, grapes and berries. 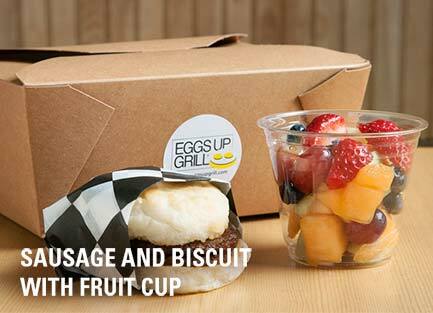 Savory Breakfast Sausage tucked into a warm buttermilk biscuit, served with a fruit cup. Boxes include utensils, chips and a cookie. 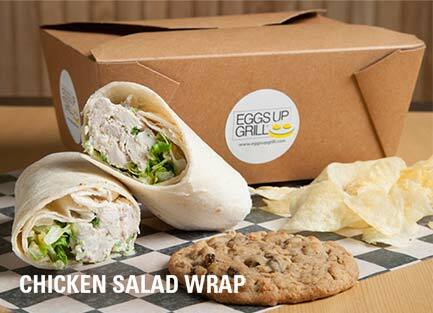 Our freshly prepared chicken salad with lettuce, wrapped in a flour tortilla with chips and a cookie. Crispy bacon, thinly sliced turkey breast, ham, fresh lettuce, tomato, cheddar cheese and mayonnaise with chips and a cookie. Thinly sliced turkey breast, crispy bacon, lettuce, tomato and mayonnaise with chips and a cookie. A Simple Classic. Crispy bacon, lettuce, tomato and mayonnaise with chips and a cookie. 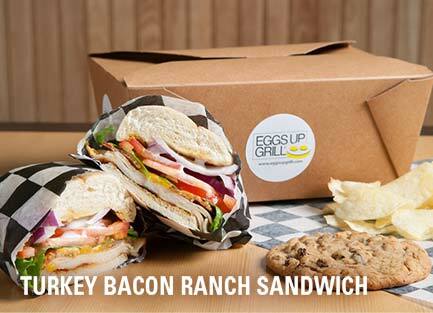 Thinly sliced turkey breast, crispy bacon, Swiss cheese, lettuce, tomato, avocado and mayonnaise on grilled Tuscan bread with chips and a cookie. Mixed greens, hard boiled eggs, tomatoes, red onions, diced green peppers, cheddar cheese and seasoned croutons, garnished with julienned red pickled pepperrs. 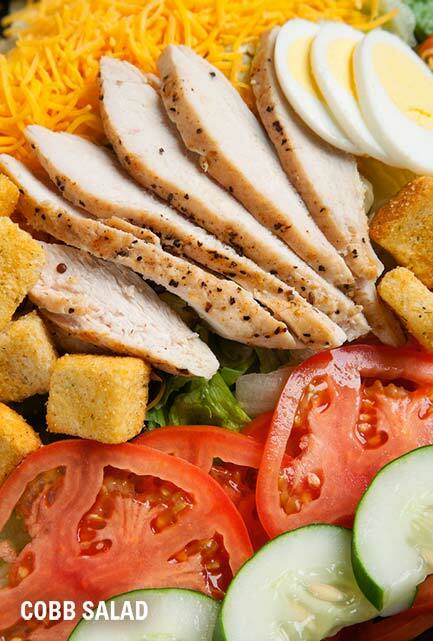 Mixed greens, bacon, avocado, onions, tomatoes, hard-boiled eggs, grilled chicken breast and cheddar cheese. 96 oz. of our regular or decaf coffee. Served in a handy caddy with complimentary cream and sweeteners. A gallon of refreshing iced tea. A gallon of delicious lemonade. A gallon of refreshing apple or orange juice. 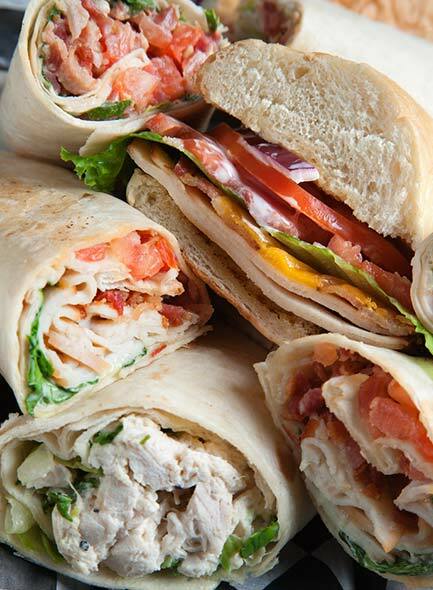 Because our food is prepared fresh daily we recommend a 24-hour advance notice on all catering orders. Delivery is available, charges may apply.